Sister: She got scared and hung up before her call went on-air. Me: (laughing) That doesn’t sound like mom! 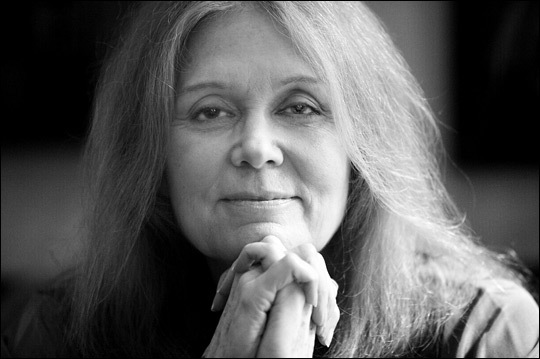 Sister: I know, Gloria Steinem scares people. Me: I guess so. I don’t think I’d want to get into a debate with her on the radio, even if I felt I had a valid point. That conversation got me thinking about how we are viewed by other people. It is great to be an activist and try to further a cause that will improve the lives of others. What concerns me is that having strong opinions is sometimes off-putting, or perhaps how we present our views alienates or confuses the people we, as activists, are trying to reach. For instance, if my mother felt more comfortable and went through with that call, she may have discovered what Gloria Steinem originally said about SAHMs was not articulated clearly. Not only that, but her explanation to my mother could have also helped other listeners who could have been equally offended or confused by what they believed Steinem’s message was. For the record, Steinem has spoken about her views of the “Stay-at-Home-Mom” in other interviews- which seem to align with my own feelings on this issue, and I also believe my mother’s. “The goal of feminism is to honor and value all productive human work and open it up to everyone — including work that has been devalued because women, the de-valued half of the species, do it. To say that homemakers “don’t work” is a form of semantic slavery. Actually, homemakers work longer hours, for less pay, under worse conditions (more violence, depression, drug and alcohol addiction etc.) — and less security (more probability of being replaced by a younger worker!) — than any other class of workers in the country. So we can help a lot if 1) we never say “I don’t work,” but rather “I work at home;” 2) never put “just” in front of homemaker; 3) expect and require men to be homemakers and nurturers, too, whether that means husbands who cook, or sons who do their own laundry, or single moms who find male baby sitters and “mannies” so their kids grow up knowing that males can be as loving and nurturing as females — just as women can be as accomplished outside the home as men. If you decide to go back or into the paid labor force after your kids are more on their own, you could turn your homemaking life into a business-style resume: for example, you contracted for services, ran a budget, socialized new humans, did volunteer work that was a job in itself – whatever. We can do all that as individuals. As a movement, we can also pass legislation to attribute an economic value to care giving at replacement level (whether care giving is raising children, talking care of elderly parents, AIDS patients; whatever), make this amount tax deductible in a household that pays taxes, or tax refundable in households too poor to pay taxes (thus substituting for the disaster of welfare reform). This Caregivers Tax Credit unifies the so-called soccer mom and the welfare mom because both benefit. You can find out more about this legislation, which just expands the refundability principle we won in the Child Tax Credit – though a lot of people don’t know they’re eligible; you should publicize that – to care giving. The website for the tax-credit campaign is caregivercredit.org. The question I have for all of you is, how do you think we can come across as inviting and warm, while still holding clear and strong opinions on certain topics? Is it possible to have a strong opinion and not seem abrasive? As much as we hear we shouldn’t care what other people think (and to a point I think that is definitely true) I do, however, want people to find me approachable to converse with and open up about their own views, even if they feel they differ from mine. I personally think I could improve in this area, and I think many other people feel the same way. WildflowersObjectification as Marketing: Are You Offended By This Ad? Natural and Holistic Baby Expo Giveaway! My main concern is an abrasive attitude comes across as showing little concern for the feelings of others. I think that is what I am worried about. Even if the person you are speaking with has an intolerant and unkind attitude it never seems like it would be helpful to treat the person like they don’t matter. They do…they matter enough to where you want them to see why their views could potential hurt others. Everyone has value… I think MLK Jr. did a great job of making everyone understand their worth while not being a push-over. He stood firm in his beliefs, used harsh realities to prove his point and further his message, and at the end of the day made it clear every person on this earth matters. The Black Panthers, specifically Malcom X is a good example of someone of the kind of abrasiveness I was referring to, though. I think that is why he isn’t given as much credit as I think he deserves for his activism and fighting oppression. Well I know you’ve never seen abrasive to me. I think it’s because when it’s your voice (as opposed to Time article, or misquoted around the blogosphere) I rarely see you advocate AGAINST anything. One counter example was a post you had (I think) against adoptions in a particular country… And that post was all about educating on hidden problems and political issues, rather than ranting about people’s selfishness or ignorance. You mostly talk about what your family does, why you believe it’s positive, and what important needs it’s serving. I’ve never heard you claim your way is the only way to meet those needs. The lack of judgement and negativity is key. Thanks Meagan! That means a lot coming from you! I don’t think I wrote the article you are referring to (although it sounds really interesting!)…. Could it have been another blogger? Or actually, could it have been a guest post from Grace? She occasionally does guests posts tacking some really difficult realities in international adoption. Guest post seems most likely… I’m pretty sure I read it on this site? I get everything in my rss feeder so it’s not always 100% clear. 🙂 I was just trying to think of something I’d read here that speaks out AGAINST something, and that’s all I could come up with. So maybe my original point is even more supported! I think it definitely can be a tricky balance. Anything we feel strongly about we’ll likely want to deliver in a confident manner. I think the way to not come off abrasive is in the delivery and the response to opposing views. As we consistently show our personality, we will less likely to be seen as abrasive, unapproachable, or intimidating. I think people get abrasive when there is a lack of respect of ofhers (and their opinions). We can approach it in way such as “I feel X, but would like to hear why you feel Y.” I know personally I have empathy deeply ingrained in me so I am always trying to understand how a person has come to feel a certain way on a certain issue. When we are open to understanding others and getting in their shoes, we are less likely to have abrasive conversations. I’m glad you’re posing this question and I am glad your mom made the effort to even make the call. We need to have these important conversations in order to get anywhere! Yes! Empathy…that is so important. You strike me as one of the least abrasive people around! I think you’ve hit on the key: it’s all about treating the other person or audience respectfully, even when you disagree. I think there’s a place for straight-talk, passionate argument, strong opinions. And sometimes, certain personalities just come across more strident and harsh than others. But the language chosen to express our points, the tone, the way we treat those we disagree with, makes the difference. Tolerance doesn’t mean we respect everyone’s *opinion,* but we respect the *person* who holds the opinion. Because that person is our brother or sister, a fellow human being journeying along this road, trying to figure it all out, too. You strike me as one of the least abrasive people around! I think you’ve hit on the key: it’s all about treating the other person or audience respectfully, even when you disagree. I think there’s a place for straight-talk, passionate argument, strong opinions. And sometimes, certain personalities just come across more strident and harsh than others. But the language chosen to express our points, the tone, the way we treat those we disagree with, makes the difference. Tolerance doesn’t mean we respect everyone’s *opinion* equally, but that we respect the *person* who holds the opinion. Because that person is our brother or sister, a fellow human being journeying along this road, trying to figure it all out, too. fascinating. I have been wrong about Gloria Steinham all these years. As to your question, well you know better than anyone that your message can be twisted by the media for their own purposes. Writing your own blog and continually opening the lines of communication to all points view is a strong way to be non-abrasive. Also, some “feminists” or “breast feeding advocates” or “insert activism cause here” can be overly zealous with their “my way or the highway” views. oh my, rereading that with all those typos tells me it is time for bed. Hope y’all got the gist of what I was trying to say.